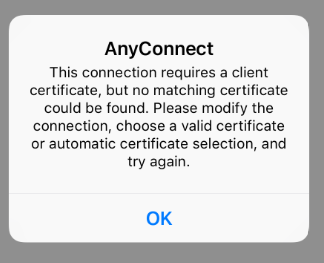 Description: The latest AnyConnect app needs a specific procedure to import certificates. It is not allowed to access Certicates stored in the iOS Profile. Causes: The latest iOS no longer supports the legacy Any Connect app. 1. Make sure the Post Auth action for your ASA realm is set to "Create PFX Link (ASA)"
2. On the Device, log into the SecureAuth webpage to get a link to the PFX file. If you're using Safari and you click on the link, it'll try to download it into your iOS Profile which doesn't help as AnyConnect is not allowed to access that. 3. Long press on the link and this will give you the option to Copy the link. 8. You can now use this Cert to log into the VPN.